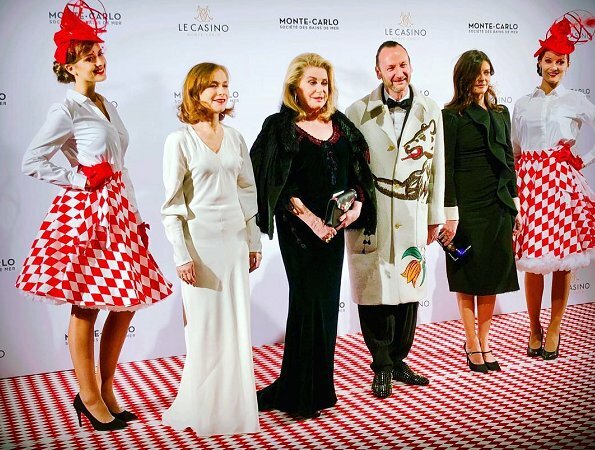 Yesterday evening, on December 9, 2017, Princess Caroline of Hanover attended the Surrealist Dinner Party hosted by Belgian designer Charles Kaisin at the Monte Carlo Casino in Monaco. Charles Kaisinis a designer whose work explores the processes that generate a form. This always looks like a fairly wacky but interesting event! I like Caroline's look - very Victorian "Grande dame" and with little touches that make it appropriate to the event. I like the softer styling of the hair as well. ¿Hay algo en Mónaco que no sea surrealista? Beautiful dress; kudos to the designer. Everything I could say would just echo everyone else! This is a very elegant look for Caroline. I like her jewelry, too.